Our aim is to give you the opportunity to purchase sustainable timber products that are made from a totally sustainable resource from local woodlands. All the following materials have been cut this season and are AVAILABLE NOW . We supply hedging stakes. Normally 5'6" but other sizes can be supplied. These are made predominantly from hazel and Ash. We supply poles from 20mm diameter up to 100mm diameter in sizes are up to 5metres long. 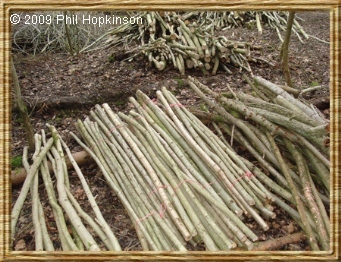 A range of species including Silver Birch, Ash, Alder and Hazel are available or can be cut to order. PEA STICKS £8.50 PER BUNDLE OF 20 - 4 ft long well branded with 1ft of clear growth at the bottom. LARGE PEA STICKS £12 PER BUNDLE OF 20 - 5 ft long well branded with 1ft of clear growth at the bottom. Normally Hazel or Ash - bundles of 10. LONG BOW STAVES £25 EACH from Green Ash 2 metres( 6ft 6") long. We have Cleaved Ash Long bow stave billets sometimes available. The diameters of the logs they have been cleaved from are between 6" and 9". We can also supply staves cleaved from larger diameter logs. Each log has been cleaved into quarters or eigths. poles 5'6"long with burs removed and sanded. One end chamferred. Sold in bundles of 10. SWEDISH TORCHES.Pine and Larch logs with vertical cuts. Brilliant for illuminating Barbecues, parties and outside events taking place at dusk or in the dark. 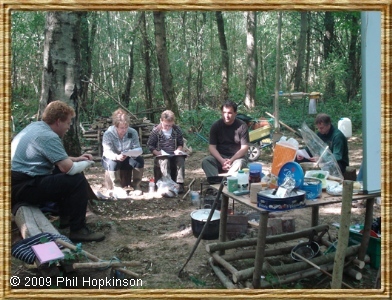 KINDLING made from popular felled as part of a programme to remove non-native species from a local nature reserve. FIREWOOD Including Alder, Cherry, Ash and Oak and Alder are available NOW for firewood, logged and split. We deliver loads of approx one cubic metre (equivalent to approx 2 builders bags) locally around Malvern and Worcester. 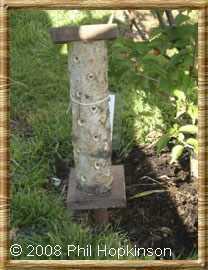 We also make ladybird houses from locally cut Silver Birch. If you would like to discuss a potential order please e-mail us at info@malverncoppicing.co.uk or go to the Contact Us page. All products pictured have been designed and built by us.